Anyone who revelled in the brilliant splicing of Regency-era court politics and fantasy fairydom in Zen Cho’s award-winning debut Sorcerer to the Crown will thrill to be back in her unique and picaresque world, but new readers shouldn’t be deterred from starting here. Moving from the enchanted witch-isle of Janda Baik to the contested realm of fairy and the rivalry-riven domain of the newly appointed Sorceress Royal, Cho’s story is driven by fast-paced plot and whip-sharp dialogue. A pure pleasure to read. The enchanted island of Janda Baik, in the Malay Archipelago, has long been home to witches. And Muna and her sister Sakti wake on its shores under a curse, which has quite stolen away their memories. Their only hope of salvation lies in distant Britain, where the Sorceress Royal runs a controversial academy for female magicians. But the pair travel via the formidable Fairy Queen's realm, where Sakti simply disappears. To save her sister, Muna must learn to navigate Regency London's high society and trick the English into believing she's a magical prodigy. But when the Sorceress Royal's friends become accidentally embroiled in a plot - involving the Fairy Queen's contentious succession - Muna is drawn right in. She must also find Sakti, break their curse and somehow stay out of trouble. 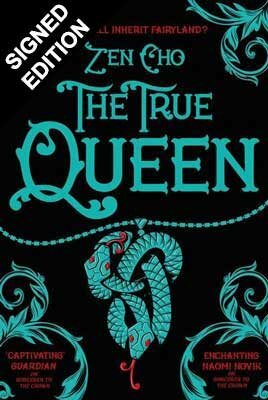 But if fairyland's true queen does finally return, trouble may find her first . . . The True Queen is Zen Cho's spelling binding second book. It's set in a sparkling version of Regency London, with a fairy tale twist. And although it's set in the same world as her award-winning novel, Sorcerer to the Crown, this reads as a standalone. I'm grateful to the publisher for a free advance e-copy of this book via NetGalley. I have also bought a copy, this book is beautiful thing!